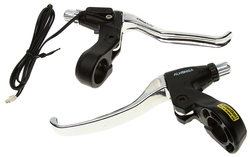 Front and rear brake lever set. Rear Lever has wire mounted for an aux. rear brake (not included). Wire is easily removed to create a standard looking brake lever.